I ate this salad for lunch! Several years ago when I was the Marketing Director at University Mall, my friend and Assistant, Cindy, and I went on a diet together. We were so dedicated and both very successful. I lost 75 pounds and she lost 45! Yea for us!! We often joked that this salad at California Pizza Kitchen was the secret to our success. Minus the candied walnuts, this salad totally worked with our diet and on any given week you would find us at CPK chowing down. Cindy and I are now both married and living with much less "expendable" income. Husbands and a mortgage will do that to you. 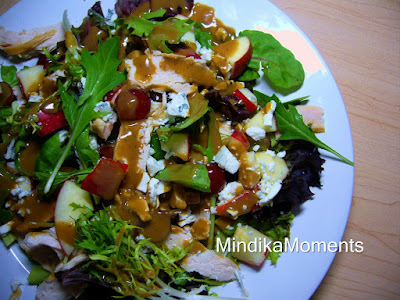 So I had to learn to make this salad at home, and it still tastes just as good. However, Cindy is now the Marketing Director at University Mall and every now and then we still meet at California Pizza Kitchen to splurge on our favorite salad! 1. Toss all the above ingredients together. 2. Top with Balsamic Vinaigrette. Dissolve sugar and water on stove top and bring to a boil. Add walnuts and stir until syrup turns to granulated sugar state, then keep stirring until sugar re-melts and sticks to nuts. Turn onto cook sheet to cool. I love this salad!!!! I'm excited to try it!! !